Here are a bunch of free poker training videos aimed toward providing strategy and tips for no limit Texas Hold'em games. All of these strategy videos are completely free, so you're definitely getting your money's worth here. It's cool to see the advice from the strategy articles getting put in to action in real-life (well, online) situations. YouTube.com/user/thepokerbank is the most up-to-date place for ThePokerBank's strategy videos. The videos on this site have helpful links and descriptions, but the newest stuff is on YouTube. Wait a few seconds for the videos to load. If you're having any trouble at all viewing them, contact me. What are free poker strategy videos? Poker training videos usually involve a professional/incredibly good poker player recording themselves playing a session of online poker. As they go along, they will comment on their plays and try to explain why they are making their actions and why they believe they are profitable. As you can guess, this is a great way to learn as you watch these videos. Some training videos differ slightly in format, but that's the general idea of how most Texas Hold'em strategy videos work. Where to start with Texas Hold'em strategy videos. Although these free training videos have been ordered by coach and the date they were added, you can pretty much pick and choose any video at random to watch. There's no need to watch the videos in any particular order. It may be easier to watch videos in order for ease of use, but it's by no means a necessity. Most players will look to watch videos similar to the stakes and game type they play. For more training videos, you should check out the poker training section and consider signing up to one of the major poker training sites. 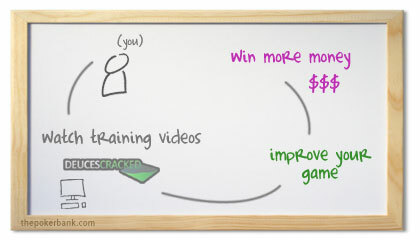 The videos on this site are helpful, but you can find a lot more videos by a wider variety of top-notch coaches at training sites like Deuces Cracked and PokerSavvy Plus. If you're serious about improving your game, you'll broaden the variety of strategy videos that you watch and not just leave it at the strategy you learn from this site, as awesome as I like to think it is. Trust me when I say they're worth it.